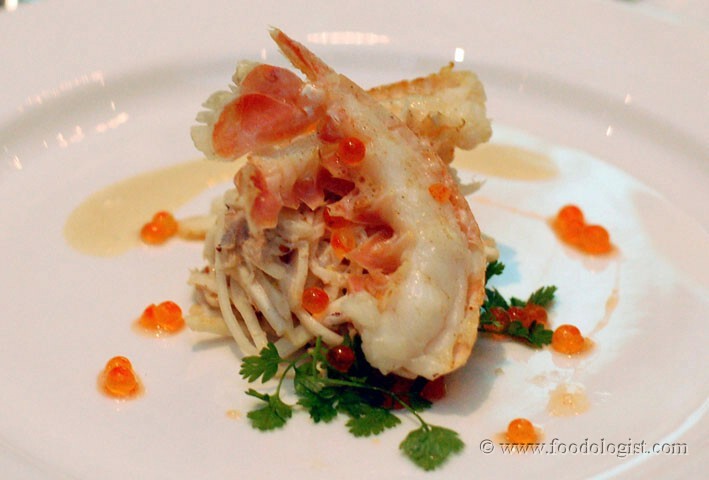 Every two years, a food festival that is the envy of all Australia comes to Adelaide and foodies from the world over attend a dazzling display of exquisite cooking, local and not so local ingredients and foodie discourse. This year at Tasting Australia 2007, a whole heap of celebrity ‘pan-rattlers’ have descended upon Adelaide to showcase their wares and this year Matt Moran of Aria fame in Sydney put on a five course degustation which at $120 per head was an extraordinary opportunity to sample the food of one of Australia’s top chefs and gain an insight into his approach to food and his thoughts on Australian and global cuisine. Before the meal, Matt came out a spoke about his food and the current state of dining in Australia with particular reference to Adelaide vs Sydney and the subject of prices. He pointed out that whilst Sydney chefs would have higher overheads and higher wages to pay, the cost of dining in Sydney is still way higher than that in Adelaide because people were prepared to pay more for better service and more lavish dining experience. To some extent I would have to agree. 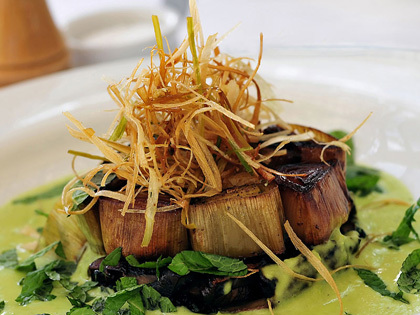 I would have to say that whilst some of the food in Adelaides top restaurants is on par with that seen at the top restaurants anywhere else, the total dining experience and facilities within the restaurants is not of the same standard. People might argue that the food is all that matters and in the lower to middle end of the market I would have to agree but it is important to remember the origin of the restaurant in post revolutionary France (other than as a restorative soup from which the name originates) which emerged as the first establishments where diners had a choice of what we got to eat and was a space where people did in public what they normally did in private (for more on this, see Rebecca Spang: The Invention of the Restaurant). It was supposed to be more than just a meal but an event and in order to do this, you need lots of staff. Ultimately, you get what you pay for and it appears that right or wrong, Adelaide diners are on the whole not prepared to pay what their Eastern state counterparts do for a meal. This was a great little dish. 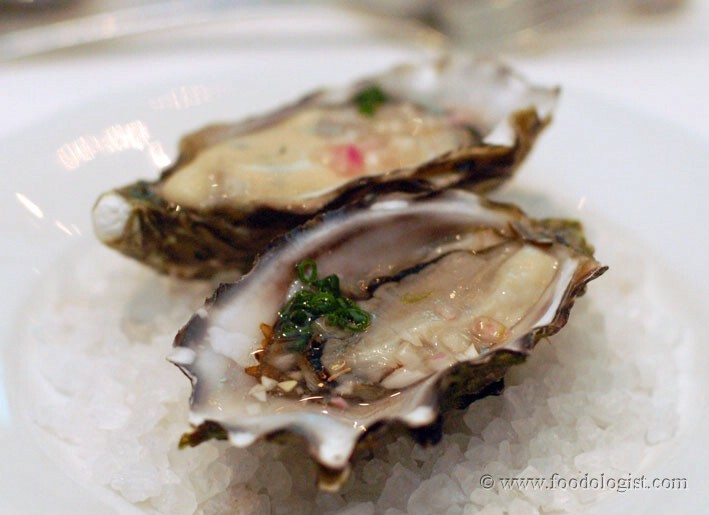 The flavours were subtle and fleeting but nontheless there with the Chardonnay dressing providing a nice little sour note to balance the salty sweetness of the oysters which was accentuated by the Moet. My personal favourite of the night. 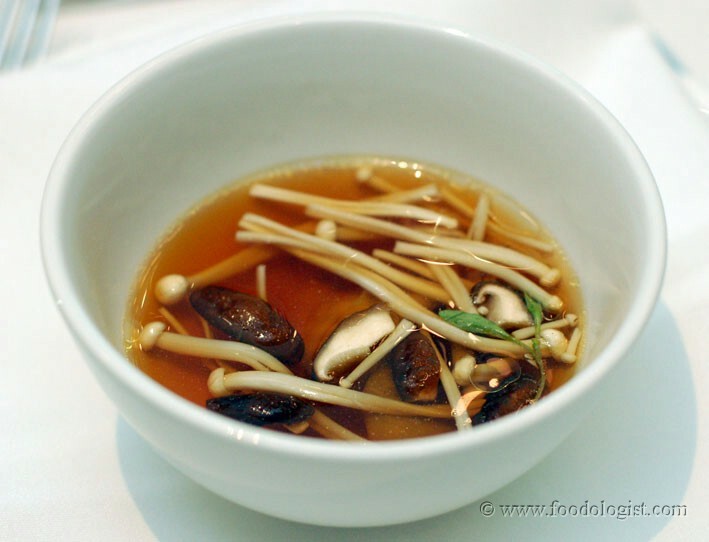 The flavours were clean and crisp with the enoki and shitaki mushrooms providing earthy undertones to the perfection of the consomme. Think pure, perfect liquid peking duck and you’re nearly there! The Feral Fox came out looking like reddish dishwashing water but was adequately matched to the dish. This was a nice little dish, again with earthy tones provided by the celeriac with the scampli and accompanying bisque providing a beautiful sweet seafood taste even more exquisite than that of lobster. The salmon eggs gave a nice little crunch to the dish and the addition of crab to the celeriac added a nice little extra dimension to the dish. The wine was good and perfectly drinkable but the pairing was my opinion not quite right but overall still good enought not to divert my enjoyment of the event. I know that this dish is listed in the book and he was plugging it on the night (quite successfully too I might add as I look at my signed copy sitting on my bookshelf! 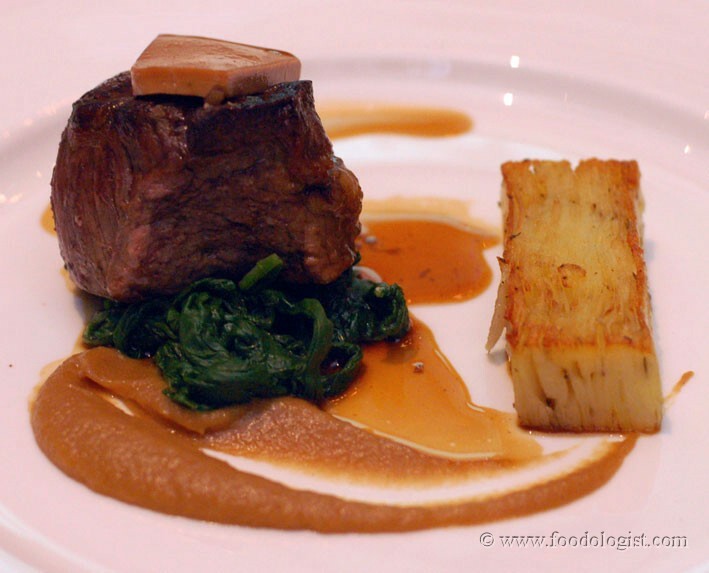 ), but I dont really know what all the fuss is about with beef fillet. Whilst my favourite cut of beef is Porterhouse (with Brisket a close second), I can understand them not using those cuts for this type of dish but I would have loved to see the same thing done with a piece of Rib Eye. Perhaps its the French influence but to be honest be done with it and add a piece of truffle to the foie gras that was already on it and call it Tournedos Rossini! The extra fat from rib eye would have added an extra dimension to the dish. The potato gratin was lovely and the Cepe Madeira sauce was to die for. The wine match here was perfect although in Adelaide one would generally expect to see a Shiraz paired with this type of dish. For me this wine was just right. Whilst my wife loved this dessert, I adored the wine. You could see the care put into this dish. 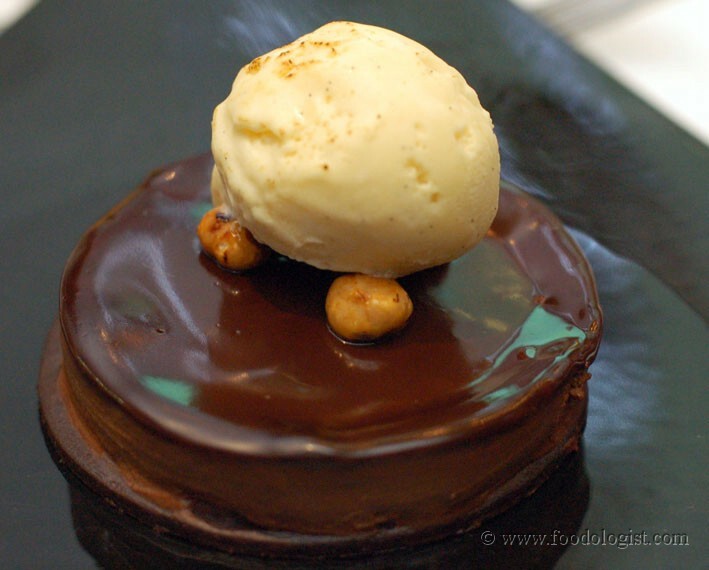 The crisp, crunchy biscuit base, the light and fluffy filling and the decadent shiny cover were matched perfectly by the vanilla ice cream and candied hazelnuts. Whilst some people might dive into the ice cream in front of the TV after a hard days at the office, this is the sort of thing that Darth Vader would handle after a long hard day. It was sweet…it was wicked and it was great. Overall, we had a great night. Matt is obviously a highly talented operator and deserves to be in the position that he enjoys today. It was a great opportunity for the Sebel Playford to host such an event and I look forward to more of the same in the future. Hey George! Beautiful pictures…I must take lessons from you! And I totally dig the Rebecca Spang reference…as I was reading the beginning, it was like listening to Barbara in Principles again. Thanks for the post. I thoroughly recommend you reading the whole book. It’s a great read! I can see where you are coming from about the non-food aspects of dining being important, but for someone like me who is young and doesn’t have a lot of disposable income to spend on eating out, Adelaide is a much more accessible place to enjoy some excellent food.